Bengaluru, March 18: Late Congress leader M H Ambareesh's wife and actor Sumalatha on Monday announced she will contest from Mandya seat as an independent candidate in the upcoming Lok Sabha polls. Sumalatha will be contesting against Nikhil Gowda, an actor and son of Karnataka Chief Minister H D Kumaraswamy. She said she would file her nomination from Mandya on March 20. Flanked by Kannada actors Yash and Darshan, Sumalatha said her decision to fight the elections from Mandya would cost the Congress dear as it would be very tough for the party to make a comeback in that region. "Many Congress leaders in Mandya are facing identity crisis and they came to me and requested me to contest the election. Therefore I decided to contest. This decision would cost the Congress dear. It would be very tough for the party to make a comeback in that region (Mandya)," she said. HD Kumaraswamy's Son Nikhil Likely Candidate for Mandya Lok Sabha Seat: JD. She said she had approached Congress leaders seeking to contest from Mandya, but the party denied her a ticket due to coalition compulsions. However, many Congress workers and leaders who were facing identity crisis in Mandya requested her to fight the elections, Sumalatha said. Congress leaders including Water Resources Minister D K Shivakumar, KPCC president Dinesh Gundu Rao and Congress Legislature Party leader Siddaramaiah had declined her a ticket. 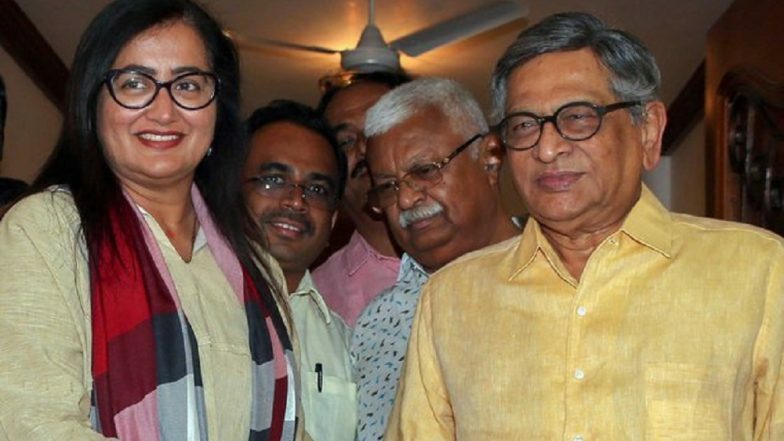 Thereafter, Sumalatha also met former union minister and BJP leader S M Krishna and sought his support, but did get any offer from the BJP, despite a section of the party leaders being keen on fielding her. Asked if she still expects the Congress and BJP leaders to support her in the elections, Sumalatha hoped that they would do that because they loved Ambareesh as he was loved by all parties. "I have been reading in the media about some BJP and Congress leaders willing to extend support to me. I hope I will get their support because Ambareesh was an apolitical being and he was loved by almost all political parties," she said. Asked which party will she support if she wins from Mandya, Sumalatha said she would take a decision after consulting the people of Mandya. She said she was not bothered about losing or winning the election, but jumped into the fray because of the demands of the fans and supporters of Ambareesh. "I declined so many posts including MLC's offered by the Congress in the past. I am entering in to politics for the people of Mandya. I have heeded the people's request. It is Mandya or nothing for me. I am going to fight for Mandya. I am not bothered about winning or losing," she added. Asked if she would invite Bollywood and Sandalwood stars to campaign for her, Sumalatha said, "I have not invited any stars, but Yash and Darshan came on their own as they consider themselves a part of my family. However, I have faith in the people of Mandya and they would vote for me to fill the vacuum left by Amareesh."